The Lexmark 2590N+ is a worthy investment for workgroups that do a lot of forms printing. This task-specific printer supports narrow to wide format forms printing, allowing convenient forms production in busy office environments. The Lexmark 2590N+ forms printer is a more suitable choice for workgroups as it offers network support and it can produce more documents at faster rates, increasing workgroup productivity. However, the Lexmark 2590N+ 24-pin dot-matrix printer is only limited to printing multi-part forms, making it a less versatile choice. Measuring 19.4x11.4x7.7 inches, the network-ready Lexmark forms printer 2590N+ is not a bad fit for a desktop. It is compact and ergonomically designed, featuring an easy to understand operation panel with simple buttons for adjusting the printer settings. 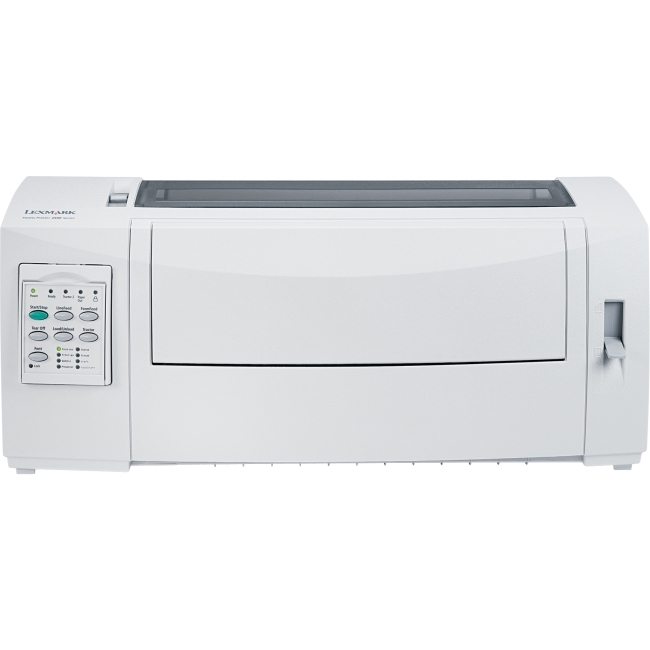 The Lexmark 2590N+ dot-matrix printer even has an automatic paper feeder, which sits in front of the unit, allowing smooth processing of print media. High capacity Lexmark 2590N+ print ribbons yield up to 8 million characters. In addition to better resolution (360x360 dpi), the Lexmark 2590N+ printer boasts faster print speeds, averaging 556 characters per second, using the fast draft mode. It has versatile connectivity, including a high-speed USB port, and an Ethernet interface, which allows convenient networking for multiple users. The 2590N+ forms printer also supports different kinds of media, including continuous forms and plain paper. Cut forms and media as small as 3x3 inches can also be used. The Lexmark 2590N+ dot-matrix network printer addresses networking issues, but it is still limited to forms printing, which means users will have to invest in another printer to do other printing tasks.